Last week the Zonemaven provided the story, as told by a parent of a WWU student, of a disaster of a detached ADU in Fairhaven. The ADU was on a lot that also contained a two-story, single family home that also appeared to be in questionable condition. Click here to refresh your memory on that horror show. A photo of the house and the detached ADU is at left. A few days ago, the Zonemaven visited that house to give the renter(s) a flyer on taking the survey of rental conditions sponsored by the Viking Community Builders. (Click here for the survey) A young man answered the door and told the Zonemaven that he had just moved in weeks before and that he was a construction worker. He was vaguely aware of the problem with the ADU and knew that someone had just moved out. The Zonemaven spent a few minutes telling him the ADU story and then asked him if he had experienced any serious problems with his rental. He said "not really" and then invited me into the house to take a look. First of all, the treads of the stairs leading to the small front porch had just been replaced however they were of uneven length. The treads were also not uniformly deep creating an uneven stair pattern. The entry way into the home was dirty and plaster was falling off the wall exposing the bricks underneath. The foyer linoleum was filthy and badly worn. Entering the living room, the Zonemaven discovered an aging and large gas heating unit on the floor that occupied about 20% of the room's floor space. The unit was vented through the wall, presumably to the outside, by metal stove pipe duct work. Several of the access panels of the unit were not in place, exposing what appeared to me to be the ignition element. Since the unit was on the floor, any object dropped on it could easily hit the inner workings of the heater. Moving into the kitchen, the Zonemaven asked if the windows operated properly. He said that some did, however, the window above the sink would not lock and that he discovered that it would fall out of the window frame - so he screwed it shut. The door to the back foyer had a non-operational locking mechanism. The foyer had a plywood floor that was rotten at one end due to a hole in the wall that let the rain from outside flow from the concrete pad into the house. The kitchen appliances were old and worn but appeared operational. The enamel kitchen sink was badly worn. The bathroom had recently been partially remodeled and the tub/shower area was new. The tub grout was already separating from the wall/tub junction at one end suggesting that the tub was moving vertically either because of the weight of the person in the shower or because the floor was not stable or both. In fact, the floor was visibly slanted toward the tub and the tenant opined that the sub-floor might be rotted. The house was badly in need of paint and the gutters in the rear were twisted and partially separated from the eaves. The Zonemaven had no access to the second floor of the residence that was a separate living unit. The renter was not available. Upon leaving the residence, the Zonemaven went to the alley behind the home where the dilapidated ADU was located. This was the unit mentioned in the first paragraph above. Since the departure of the student renter, the entire south side of the ADU had been stripped of its siding. This was the side that had rotted completely away in one corner. More from the mother of the student: "Icing on the cake-- My daughter actually cleaned this place before she left so she could get her deposit back! (Including black mold that covered the bedroom wall behind her bed.) They returned the deposit less $75 for carpet cleaning! The carpet was not cleaned before she moved in nor before her housemate at the time, who moved in prior to her. I can't imagine they are going to clean the carpet now. She is not sure if they are tearing down the whole building or just the wall. I was under the impression it was the whole building, but not sure why." ... "FYI her place just had the 2-pronged plugs also. I also wondered about her ancient appliances. It seems the city inspected [as the result of their formal complaint in December] the structural aspects but not the electrical. Hopefully Bellingham will start to have rental inspections!" She goes on in a later email: "When I first visited my daughter in Feb of last yr I bought her a smoke and CO2 detector because her smoke alarm didn't work right and everything was so old I thought it very possible that it might save her life. The smoke detector that was provided went off continually every time she took a shower and the steam came up from downstairs (since there was no ventilation) so she took the battery out. Not a good thing to do, but I wonder how many ...tenants have the same problem and remove the batteries? ... It seems that for some of these realtors, avoiding blame is all they are really concerned about, not the safety of residents. It is pretty disgusting." 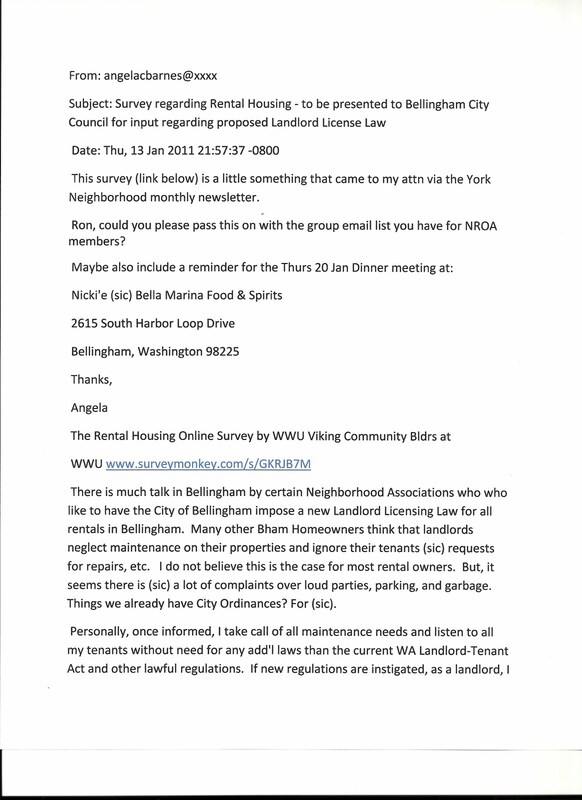 The Zonemaven encourages the residents of Bellingham, especially the renters, to write to the mayor (mayorsoffice@cob.org) and to the city council (ccmail@cob.org) and ask them to do the right thing, license and inspect rentals. Support for rental licensing seems to be a difficult topic for some neighborhoods and individuals. To date several neighborhoods have written to the Mayor or to the City Council to indicate that they would like to see licensing and inspection of rental units. These neighborhoods are York, Samish and Sunnyland. The Associated Students of WWU, that represents the student body at WWU, has passed a resolution in support of licensing. The student run newspaper, The Western Front, has also expressed support in an editorial last year. Why are others sitting on a fence? The argument given is that there is no ordinance to support. This is true . It is also true that the City Council is hesitating on taking action on an ordinance, in part, because there is not enough support from the citizenry. So, we are in this gray zone of hesitant support until a draft ordinance makes its appearance and no draft ordinance until the support is there. Chicken/support - egg/draft. Egg/draft - chicken/support. Dan Welch, The Mayor's Neighborhood Advisory Commission (MNAC) representative from the Birchwood Neighborhood, reminded the Zonemaven that the commission had asked "that a "mock-up" of this [licensing] program be put to paper...something tangible that MNAC could discuss further." Dan went on to say, "Over the past year we have not been presented with such a mock-up, describing the nuts & bolts of such a program but have been repeatedly pointed to studies of other municipalities." There is no indication that the Mayor acted on this recommendation from his commission. How might we extract ourselves from this indecision? Perhaps we make take our cue from the students at Western who developed a resolution in which the situation is clearly stated (the findings) and is followed by the suggested remedies (statements of resolve). You can read the student resolution by clicking here. 1. An inspection program run by the city that is funded by the landlords as a group through licensing rentals as a business. 2. Inspections at least every 3 years as allowed by law. 3. Meaningful fines for scofflaw landlords. 4. Exclusion of property owners who rent out a room in their own home. 5. Inclusion of unattached ADUs, carriage houses, duplexes, triplexes and all apartment buildings unless they fall under an inspection regime by HUD or some other entity. 6. Language that would help landlords get insurance reductions for being certified by the city inspector. 7. Language that could help landlords deal with the inevitable bad renter. This is a two way street. 8. If any self-certification is considered, that it be proposed only for the several years between actual inspections by the city. 9. Less frequent inspections for rentals that consistently score high in the inspection ratings. 10. Inspection of only X percent of units in an apartment complex of X size. It is almost 7 years since a licensing and inspection ordinance was discussed at the Bellingham ferry terminal. (Click here to review that event). We had a teachable moment with the fire on Grant St. Thankfully, nobody died for us to learn the lesson but we ought to have received the message about the condition of rentals. Now is the time for action. On 19 January, the Mayor's Neighborhood Advisory Commission revisited the rental licensing and inspection issue when the topic was brought forward by the representative of the York Neighborhood, Kirsti Charlton, as an additional agenda item. The Mayor was present for the discussion. The council last brought up the issue on 17 March last year, recommending to the Mayor that “a rental housing licensing and inspection ordinance be drawn up for review and discussion in 2010 in a public process." This recommendation was approved by an overwhelming vote by neighborhood representatives that implies some support for the concept of rental licensing and inspection. Kirsti introduced the topic by citing the recent fire on Grant St. that almost killed 4 WWU students. (Click here and here to read about the fire) She had a special relationship to the event as she lives in the home next to the now-burned out rental. Kirsti also had an excellent relationship with the tenants. Had the fire not been discovered at its onset, it is likely her home would have been caught in the conflagration. Anne Mackie, the York Neighborhood Association President spoke about the fire and her relief that instead of having a candlelight vigil for 4 victims, we were having a discussion of licensing and inspection, which, in the future could prevent such fires. Surely a teachable moment without a major catastrophe. Anne called upon the commission members to write letters to the City Council to again call upon them to move on a licensing and inspection program. The Zonemaven provided information to the representatives present regarding the statistics of inspections in some of those cities that had already introduced inspections of rental units. To wit: There is the definitive experience of cities that have already adopted rental licensing and inspections in the face of exactly the same opposition as we are seeing in Bellingham. Ultimately, each of these cities was proven correct in its resolve to move ahead to protect the safety and health of the renters. We already know that the city of Pasco, WA found that 15% of the units inspected under their program had serious life/safety issues. 10% had mold problems. A full 85% had problems of varying degrees. The city of Gresham, OR performed over 1600 inspections in 2009 and issued, as a result, over 4,000 citations. Lexington, KY performed inspections of units near the University of Kentucky and found that 50% had life/safety issues. Sacramento, CA began an inspection program during which one third of the units inspected had serious safety and health issues. The question for doubting council members is why do you believe that the condition of rental housing here in Bellingham does not mirror that which is found in cities that have the statistics to show that time and time again the condition of rentals in our cities is problematic? Dave Hopkinson, a resident of the York Neighborhood and himself a rental property owner gave remarks about the rationale for inspections by saying that "we take for granted that when we make a reservation at a hotel, there will be fire alarms, fire extinguishers, as wells as little maps that say "Egress is Here" and "Don't use the elevators in case of fire", and a lighted sign on the corridor that says "Exit" and there will have been an inspection that will be dated on the little tags that are attached to the fire extinguishers. Secondly, that when we eat in a restaurant, it is not necessary to go into the kitchen and look for evidence of cleanliness and absence of vermin, etc. However, for every rental, nothing can be taken for granted, except the good will - or lack of it - on the part of the rental-owner. And even that may not be enough, given the technical difficulty of health and safety inspection (and our collective power of denial)." The MNAC decided to take up a discussion of rental licensing and inspection at its next meeting. They asked for additional information about the concept. Many had not read, nor were they aware, of the reports and studies that had been prepared for the council on the issue in years past. Of special note in this regard is the study on rental licensing prepared for the council in October 2008. You can read this document by clicking here. Well, what is known about rentals of single family homes here in Bellingham? Will it take a death or serious injury to spur the city to action? You can hear a rebroadcast of the Joe Show (KBAI-AM) from 18 January on the topic of rental licensing by clicking on this link. The show is listed as "Should rental properties in Bellingham have to be licensed and inspected?" Sharing the program with the Zonemaven was Anne Mackie, President of the York Neighborhood Association. Of note was the phone-in call from Perry Eskridge of The Whatcom County Association of Realtors®. The download may take a few minutes. Be patient. At the end of my last blog posting, the Zonemaven promised an unvarnished tale from a renter. That tale follows. The Zonemaven was planning on providing comments but decided to let the story stand on its own. The email quotes below are from the mother of a WWU student. She recounts the recent experience of her and her daughter as they attempt to deal with the management of the daughter's rental. (The photos were taken by them.) It is a rather long read but worth the time. "My daughter is living in what I'm …sure is an unsafe split-level "apartment" in Bellingham. It is apparently a converted detached garage. It is very old. She is a student at WWU and supporting herself. I am visiting for the weekend from […]. I have been here once before and was not thrilled as it looks like an uninhabitable building; however, she assures me that for the rent ($545/mo) it is the best she can get. She has had a chronic mold problem, but it has exploded in recent weeks. About 2 weeks ago maintenance men came to fix a leaking water h eater which is located in the bathroom (and still has water dripping from overflow pipe). The bathroom has no opening windows nor exhaust fan, and definitely has a moisture problem. When they ventured along the side of the house they noticed that there are boards rotted and missing on the exterior with what appears to be moldy exposed insulation. The area of exposed insulation being about 1'x3'. They indicated this was a big problem and would notify the landlord. Nothing has been done. Yesterday, when we went to the property mgt. office, we were told the mgr. would be in Mon. so they would tell him and let my daughter know what he says on Tues. While here this weekend, we discovered mold on the living room windows, curtain, and bookcase which are in close proximity to the hole in the exterior wall and above the bathroom. There is constant condensation on all upstairs and dow nstairs windows. To me it looks like the exterior wood siding may all be rotting to some degree (paint is peeled everywhere). It also appears (from insulation protruding inside between the floor and paneling, and which has been painted over) that the walls are made of only paneling, insulation, and exterior wood boards some of which are rotting/missing. Well, you probably get the picture. I have just gone online to try to discover whom to contact and the health hazards involved with mold. My daughter wants it fixed, but of course doesn't want to move. The property management company, this summer, had her sign an early renewal for another one year lease. In over a year, she has never met the person who is her "property manager." Would building code enforcement be the place to start and would they come to do an inspection upon request? Seems we should start with the landlord, but at this point I do not trust them to put more than a Band-Aid on these problems, because I suspect they know about them." "Just thought I'd let you know we filed a complaint with city planning dept. on Mon. Called [...]prop mgt twice on Mon and the man in charge of that property didn't call back. Left a message that I was filing a complaint. (Also left a message on Fri for him.) No one seems to know his schedule or when he will return the call but they said he talked to the owner and maintenance man last week about what needs to be done to the place. I said it would be good if he gave us an update about that! I imagine he will hear from the city before we hear from him. Sounded like that would be today. I'll keep you posted." "She was finally able to meet with the inspector on Fri. He wrote in his report that a wall is "not structurally sound," roofing needs repair, and there needs to be a railing on the inside stairway. Not sure what else, but she is now going to let the property mgt know in writing with a copy of the inspection report attached. We know they knew about this more than 3 weeks ago when the maintenance men reported it, and they haven't returned numerous calls, but my daughter still has to put it in writing. She also met with the law students on campus on Fri which was apparently really helpful. Oh, the inspector said she needed to contact that Clean Air group you mentioned regarding the mold. He doesn't inspect for that. Also, the city said they do not contact the owner or prop. mgt. that it is up to my daughter to do that which surprised us. I also wondered at what point they say a building is not inhabitable if the wall is not structurally sound?" "My daughter feels like she doesn't have time to do any more than study for finals and look for a new place right now. Maybe when finals are done she can help by giving you the info first hand. Turns out the city did let her know that they are contacting the property mgt or owner to say they need to fix the problems or abate the building, but my daughter doesn't know what the timeline is. [...]'s prop. mgr. has still not returned her messages. She did say I could go ahead and send you photos, so some are attached. FYI-it is the bathroom window you can see at the bottom of the picture with the large hole. The inside photo is the corner above the bathroom." "I just have to write anyway as things have gone from bad to worse and it will make me feel better! Never heard from [property management]... until yesterday when they called ME to say my daughter hadn't paid rent for Dec! I mentioned the inspector saying the wall was not structurally sound and that I found it amazing that they never contacted us about that, but only when rent was overdue! She hung up on me. I called back and another woman said while my daughter gave them the inspectors report on Nov 22, (and they knew of the problem from their maintenance men the first of Nov.) their broker said they needed a letter from the city before addressing the problems which they got on Nov 29 saying they needed to fix things within 30 days. They said they've been waiting to send people out to fix, but couldn't get a hold of my daughter because she had let them know her phone was lost (she gave them her email). I pointed out that they found a way to contact me about the RENT and that THEY KNOW WHERE SHE LIVES and could obviously have contacted her at the house. Tom (prop. mgr) did go out there today to intimidate her and tell her he's been to court lots of times and wins. She went today to the free lawyer at the courthouse who said she has no rights if she didn't pay rent and... that Tom has been to court lots of times and wins because tenants don't do it right. Said even tho my daughter gave notice of the damage in writing, it was not in HER handwriting, (inspection report), and apparently them knowing of the problem a month earlier doesn't hold them accountable if she didn't put it in her writing. And they are fixing it now so she has no case. She tried to rent another place today, but when they called [property management], even tho she had told them the story, they would not rent to her because [property management] gave negative responses about her to every question. Plumber and person who came to look at the wall today were nice and supportive and shocked at the condition of the wall. Said hers is not the only [property management] property that doesn't get repairs done. Oh, she got a posted notice today to pay rent + late fee in 3 days or leave. I guess she is going to pay. She doesn't know what else to do. Tom at [property management] said she could leave while the work is being done and not have to pay rent during that time. woo woo. Don't really know if it is possible for her to stay while the work is being done if she wanted to. And she doesn't know when it is going to be done. Don't know if they will still hold her to her lease. Wouldn't surprise me. Hope she can help with your blog. Might help things change for future tenants. It is so unfair. "Just wanted to correct something I wrote. My daughter still has never met Tom. Her conversation last week was over the phone when he actually called her back for once. Sounds like she is held to her lease since they are fixing it. She is going to pay tomorrow. A 2nd atty she consulted with Saturday agreed she doesn't have a case, but said she should talk directly with the contractor about repairs, whether she can stay while they repair, etc. instead of going through [property management]. So she is going to try that." "Before [she] left WA, [property management] told her they were going to fix the place and she could stay if she wanted. They either didn't realize the extent of the problem or wanted to get 1 more month's rent out of her. As of about Dec 15 they had not applied for a permit from the city. When she returned from […] on Dec 29th there was a letter saying to please move as soon as she could because they are going to tear the building down and rebuild it. So they broke the lease and she hopes to get her deposit back though I don't at all trust them for that. I think I told you they gave her a bad reference when she tried to move out earlier in Dec. so another place would not rent to her (even though she told them the story). Then when [property management] wanted her to move out they gave her a decent reference so she could get into another place. She should have the last of her things out by now. Discovered there was only a sheet of paneling between her and the outside world in the place where the large hole was. She also had to throw away her bed because the wall was black with mold where it was up against the wall. I just hope she doesn't have health problems from this down the road." The property owner is an LLC from British Columbia. If there is another side to this story from the management company or the owner, I would invite them to send me their comments. They know who they are. The Zonemaven has obtained a copy of an email that the Northwest Rental Owners Association has sent to its membership regarding the issue of rental licensing and inspections. Let us take a look at several of the comments in the email. Y ou can read the entire text of the email by clicking on the images on the left. [The text has been transferred from the email to an image to enhance readability. Errors in the text are those of the author of the email and marked with (sic). Email addresses have been removed. No other alterations have been made.] The email's author is Angela Barnes who is listed as the association's Secretary on their website. The missive begins by stating that there does not appear to be too many complaints about landlords not maintaining their properties. The problem with this statement is that it ignores the fact that we have a complaint based system, i.e., one that is inherently defective. It is a system that demands that renters know that there is a problem to begin with. That implies that they are capable of judging all sorts of systems within the rental unit, e.g., heating, gas, plumbing and electric, not to mention structural integrity, pest control, mold and fire prevention. This requirement is manifestly absurd as applied to the tenant as well as the landlord. Neither is qualified to make judgments on rental safety unless they also happen to be qualified building inspectors. So if there is a lack of complaints, one cannot assume that the reason is that there are no problems. Ms. Barnes claims that she as a landlord immediately takes care of problems with her rentals. That is laudable, however, there are about 17,000 rental units in Bellingham. A look at the property data base at the office of the Whatcom County Assessor, shows that she owns, at least under her own name, four properties in Bellingham, one of which appears to be her residence. So then, what of the other 16,997 rental units over which Ms. Barnes has no control? The Zonemaven allows that not all of these thousands of landlords are deficient in the maintenance of their properties. There is, however, a lacuna that cannot be denied and can only be filled by inspection of rentals. Ms. Barnes then states that she will be forced to raise rents in order to comply with "new regulations", although there are no such regulations, since the law has not been drafted. One would think that as a good steward of her property, as she has told us she is, there would be no need for further maintenance expenses. The only cost to pass on to the renter, if she should so decide, would be a modest licensing fee, estimated to be around $3 per month per unit to fund the inspection program. She also assumes that she would have to pay a third party to do the inspections, although that also has not been determined since there is no draft ordinance. Surprisingly, that $3 per month for the licensing fee would bring in a substantial sum that could finance a fairly robust inspection by the city that would be of no further cost to the landlord. She also declares that these inspections are a "duty most are capable to do themselves" This is a contention that I reject out of hand for the reasons I presented in the previous paragraphs. As I have pointed out over the years in this blog, landlords, as if out of the blue, claim to be worried about raising rents, however, that has not stopped them from doing so on their own over the past several decades, even in the absence of licensing and inspections. Although not mentioned in the email, I would expect that the NROA would have on its agenda this week the house fire on Grant St. in the York Neighborhood that nearly took the lives of 4 WWU students. (Click here and here to read about this fire) In this case, the tenants did that which Ms. Barnes suggests is the solution to poor rental conditions but the management company ignored their pleas for smoke detectors and an inspection of an obviously faulty electrical system that produced the fire. Landlords have claimed time and again that they would police the few "bad eggs" in their midst. What a fine time to begin. The landlords might also discuss the ways that a rental licensing and inspection will be of benefit to them. They can advertise that their property meets city standards for health and safety. There may even be insurance premium reductions for maintaining a certified property. I do thank Ms. Barnes for publishing the instructions on taking the rental condition survey (click here to go to the survey) that is sponsored by the Viking Community Builders of WWU. Probably no body of renters knows more about the conditions of rentals in this city than the 8,000 students who are dumped on the rental market each year. Perhaps the landlords might be surprised in some cases with respect to the unvarnished experience of these renters, allowed to express themselves without fear of retaliation. The Zonemaven's next blog entry this week will be about one such case. The Zonemaven will appear on The Joe Show on 18 January from noon until 1pm on KBAI-AM, 930. Also appearing will be Anne Mackie, the President of the York Neighborhood Association. The topic is rental licensing and inspection, to include the recent and nearly fatal house fires in York Neighborhood rentals. The show is hosted by Joe Teehan, who also has a morning radio show on KGMI with Patti Brooks. Linda Pieczynski is an attorney and municipal prosecutor in Hinsdale, Illinois where she writes a blog on code enforcement. Not surprisingly, Linda supports rental inspections. She collects examples of rental property code enforcement issues and places them in her writing. Several days ago, she noted the Zonemaven in her blog entry entitled College Towns and Fire Code Violations. You can read that blog entry by clicking here. She states in the header to her blog: "I regularly blog about issues that arise in code enforcement and invite comments and ideas from you. I use examples from around the world to illustrate the issues inspectors face on a daily basis. "Here is a sample of her comments on inspections of rental housing. "College towns and code violations go together like students and text books. Students seek cheap housing and are willing to live in terrible conditions if the price is right. Some landlords take advantage of this by not maintaining their buildings and others are fearful of the damage student tenants cause and are reluctant to spend money on upkeep because of that. " "If a local jurisdiction doesn’t have an effective enforcement system, whether it’s in court or at an administrative level, there will be no incentive for bad landlords to fix up their properties. "The day after the fire [Yonkers, NY], city inspectors visited the property and issued four summonses against the [owners] for illegally converting their basement into an apartment, illegally using the first floor of their two-family home as a boarding house and blocking fire exits, among other violations." "...without vigorous code enforcement, buildings deteriorate and people suffer. To think that a family would be better off in a shelter than in one of these buildings is tragic. Housing inspectors who make life better for people who are tenants should be proud of the work they do." "In a recent post, I discussed the foolishness of owners who don’t fix their rental property and end up facing civil liability judgments that could have been avoided if they had just followed the fire code. The family of a victim of a porch collapse just reached a settlement for $2.7 million dollars in Chicago. The victim was trying to adjust a chair on the porch when he fell through the rails. " "A landlord in Ontario, Canada recently pleaded guilty to fire code violations in connection with a fire that occurred in an apartment building. What caught my attention in the article that discussed the case was a statement that landlords can be held liable if any occupant is injured in a fire because the building is not compliant with the fire code. This is true in the United States, as well. Owners run a risk when they do not fix code violations because if someone is injured or killed, there is very good chance the owner will get sued for negligence. " " Once landlords become used to a rental inspection ordinance, they tend to do a better job of making minor repairs so large ones don’t become necessary." I invite my readers to go to Linda's blog where they can find more nuggets of wisdom on rental licensing and inspection. More on Fire at Student Rental on Grant St. The two WWU renters (from the Grant St. rental that was destroyed by fire) to whom I spoke indicated that they had brought the problem of smoke detectors to the attention of the management company a month or so ago. They also said that there had been problems with tripped circuit breakers over time and that some wall plugs were the old two prong receptacles and not the grounded, three prong kind. Last night, the Zonemaven attended a York Neighborhood meeting where Bellingham Fire Marshal, Jason Napier, explained that the origin of the fire was a junction box in the attic above the bathroom on the second floor. The cause of the fire is still unknown. The four renters narrowly escaped death. Had not one of the renters awakened to get a snack, nobody would have discovered the fire. Since there were no working smoke alarms, they would likely have succumbed to the gases emanating from the blaze. Also placed in danger were neighboring homes. The York Neighborhood consists of many homes on small lots. Given the proximity of one home to another, the chances for a house fire to spread to adjacent structures is likely. A search of the property records at the Whatcom County Assessor's office reveals that the rental house is owned by David Hansen. The two renters to whom the Zonemaven spoke indicated that the property is managed by Lakeway Realty and that the company has relocated the four renters to another rental house. The students' belongings had sustained some water and smoke damage although the fire seemed to be limited to the second floor and attic. The burned out carcass of a mattress on the front lawn provided mute testimony to the events earlier that night. You can watch a video of the fire taken by a bystander by clicking here. In a news release on 11 January, Chief Bill Boyd of the Bellingham Fire Department reported yet another fire at a rental home at 1418 Ellis St. This fire occurred several hours before another in a rental on Grant St. in the same York Neighborhood. 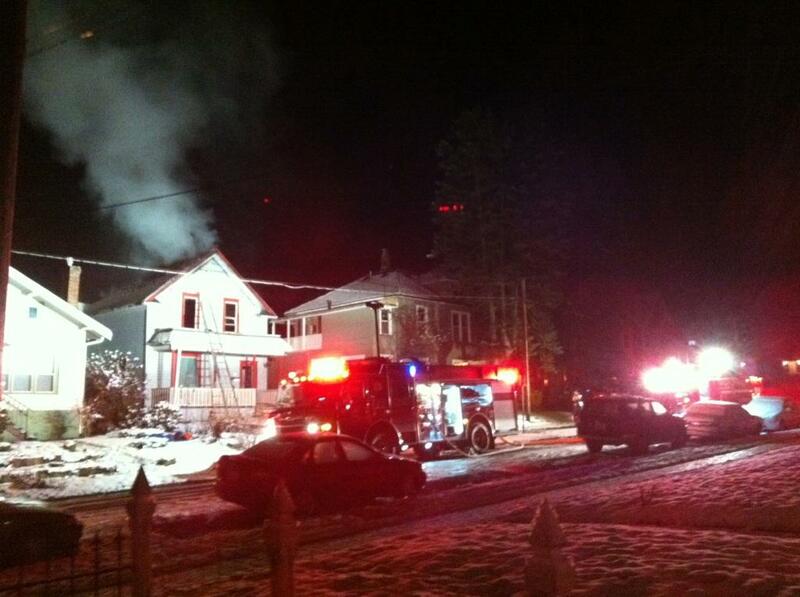 The Ellis St. fire was called in just before 6pm on Monday. Arriving firefighters found smoke coming from the first floor of the home that had been converted into apartments. Although the fire, which was burning in furniture on the first floor was quickly extinguished, the house sustained structural and smoke damage. Although there was a smoke detector, Chief Boyd indicated that a smoke alarm was not heard. The fire is under investigation but is not considered suspicious. As with the fire on Grant St., the Zonemaven will obtain the report of investigation. It remains unclear in the news release whether the smoke detector was operable. The York Neighborhood has a large number of aging homes, many of which are well maintained. Unfortunately, some of those used as rentals are in sad condition, at least as viewed from the outside, which only makes one wonder about the conditions found within. This is one of the reasons for which the City Council must pass a rental licensing and inspection law. Four WWU students were burned out of their rental home on Grant Street in the York Neighborhood in the early morning hours Tuesday, 11 January. Although it is too soon for the official report of the cause of the fire from the fire department investigators, it appears that the fire may have been electrical in origin. The Zonemaven and Anne Mackie, President of the York Neighborhood Association were able to speak to two of the renters, to include the one who had discovered the fire and alerted his housemates. They indicated that previous problems with the electrical system and the absence of functioning smoke alarms had been reported to the property management firm, however, the firm did not respond. Earlier in the evening, the students noticed that the lights were flickering. When one of the students checked the circuit breaker after hearing some crackling sounds, he found that the breaker had been partially tripped. He reset the breaker before going to bed. Later during the night, he decided to get up and eat at which time he found flames near the ceiling in the upstairs bathroom. At that time he alerted his housemates who then fled the home prior to the arrival of the fire department. Since the smoke alarms did not function, a tragedy was averted only because one renter happened to be awake. Understandably, the students are quite angry. "I am thankful that these young people got out unharmed -- also their cat. However, I am dismayed that our City Council continues to delay action on the need for a rental inspection and licensing program. I appeal to you, City Council, to take up the issue of rental housing safety as a priority. Our city needs a program of rental housing inspections, fire code enforcement and rental business licensing so that our citizens are protected. What is it going to take to make this a priority? York neighbors will be discussing this incident at the York Neighborhood meeting tomorrow night, 6:30 p.m., at Garden St. Methodist Church, and we will be assisting these young people in any way we can to help replace their belongings or help them find safe, decent housing while they are in our city." The Zonemaven will follow this story closely and provide further reports in this blog. It may be that the City Council and the Mayor will find this their "teachable moment" and take the issue of inspection of rentals more seriously. 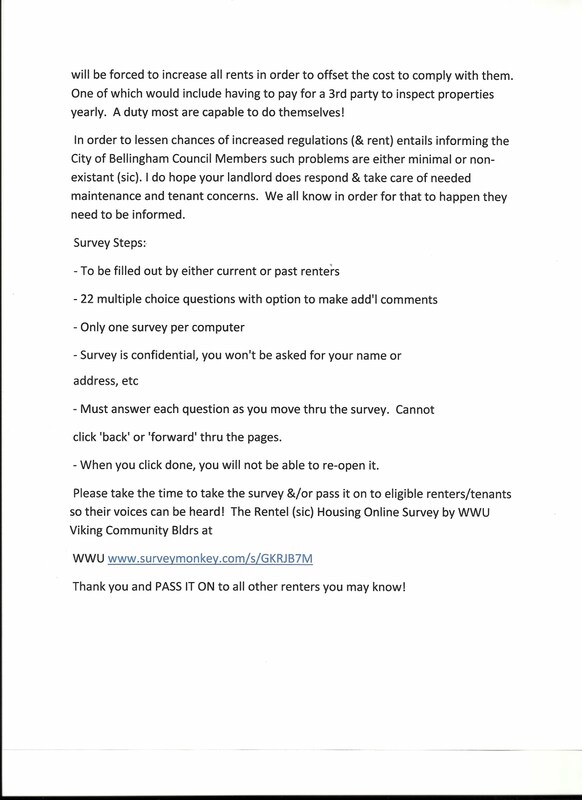 Since last November, the Viking Community Builders of WWU, have been running a survey of conditions in rentals within the city of Bellingham. You can take the survey by clicking here. One need not be a student to take the survey. You only have to be or have been a renter in the city. You can read my previous posting on this topic by clicking here.